Homocysteine Factors is an excellent product that does what its supposed to. Per my doctor, Homocysteine Factors by Pure Encapsulations is basic for good heart health. Homocysteine Factors by Pure Encapsulations arrived as described, exactly what I ordered. Super fast delivery. Will order from them again. Eating a low fat diet and getting plenty of exercise can help you maintain cardiovascular wellness. A natural supplement like Pure Encapsulations’ Homocysteine Factors can also play an important role in promoting heart health. Pyridoxal 5’ phosphate (the activated form of vitamin B6)‚ a coenzyme that’s active in metabolizing protein and maintaining heart health. Folic acid‚ a B-complex vitamin needed by the body in order to produce red blood cells. Vitamin B12‚ a vitamin necessary to produce blood cells and maintain a healthy nervous system. Vitamin C (as ascorbyl palmitate)‚ an antioxidant important to cardiovascular health. 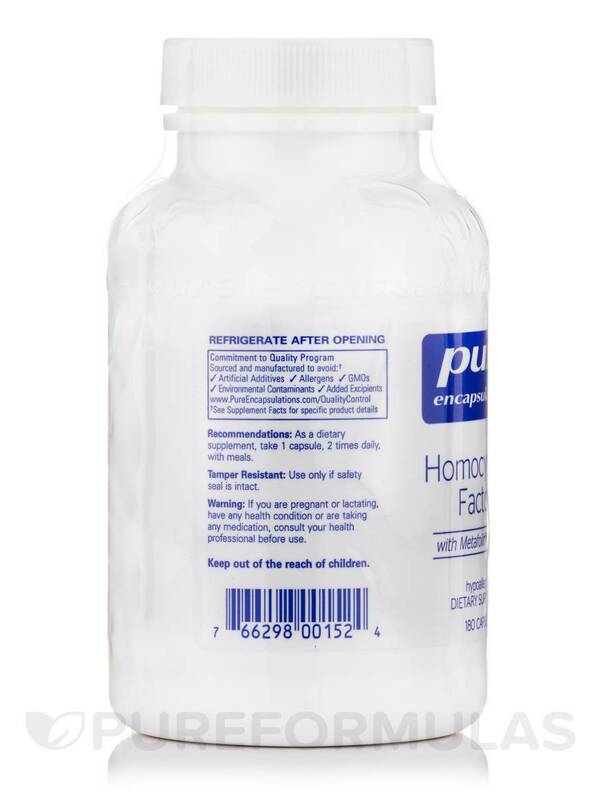 One bottle of Homocysteine Factors by Pure Encapsulations contains 180 capsules‚ which is enough to last for up to three months‚ depending on your dosage. As a dietary supplement‚ take 1 capsule‚ 2 times daily‚ with meals. I ordered this Homocysteine Factors by Pure Encapsulations product because it was recommended in Izabella Wentz's Hashimoto's Protocol. I was really impressed with the quality and I noticed a difference in my health from taking it. It is a very effective and high quality supplement. My boyfriend is taking Homocysteine Factors by Pure Encapsulations in conjunction with other supplements to keep his MS under control, he has been taking it for many months, this is his second bottle. We both notice that it seems to help keep his MS under control, but note that it is taken with many other supplements as well. He is under the direction of his Naturopathic doc and his western trained doc, who both agree that these supplements help to keep him stable. Highly recommended supplement, very high quality, with results after taking consistently. 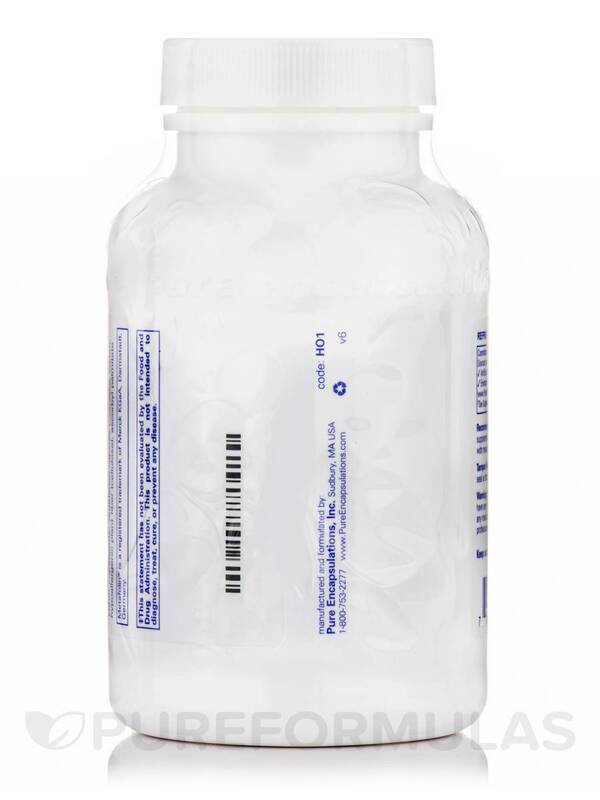 Nothing really, but you must take note that this supplement needs to be refrigerated. My doctor recommended Homocysteine Factors by Pure Encapsulations item in place of a prescription medicine and it works better. It works better without the side effects of the old prescription medication. With Hashimoto's thyroditis one has to be concerned with energy levels and the effect of the illness on the cardiovascular system. 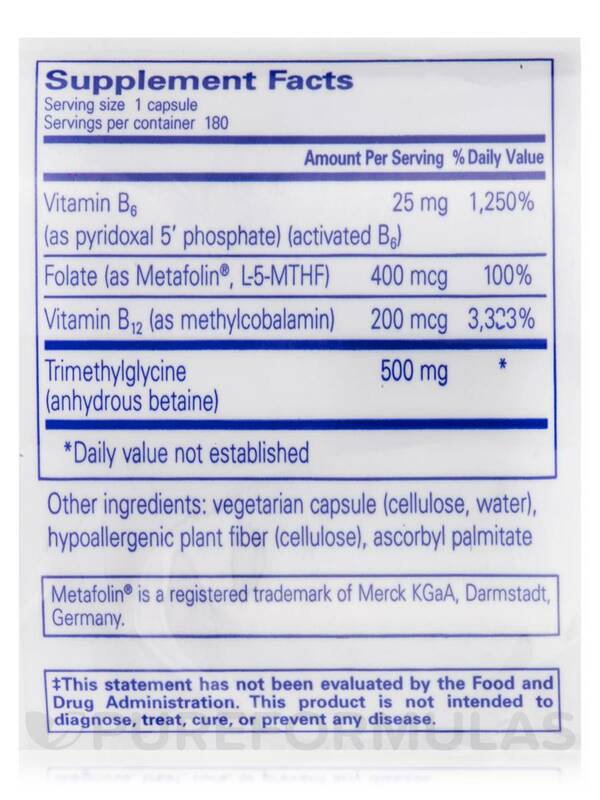 Having a methylation defect (MTHFR) means that the methylated forms of folate, B12, and B6 are a must. 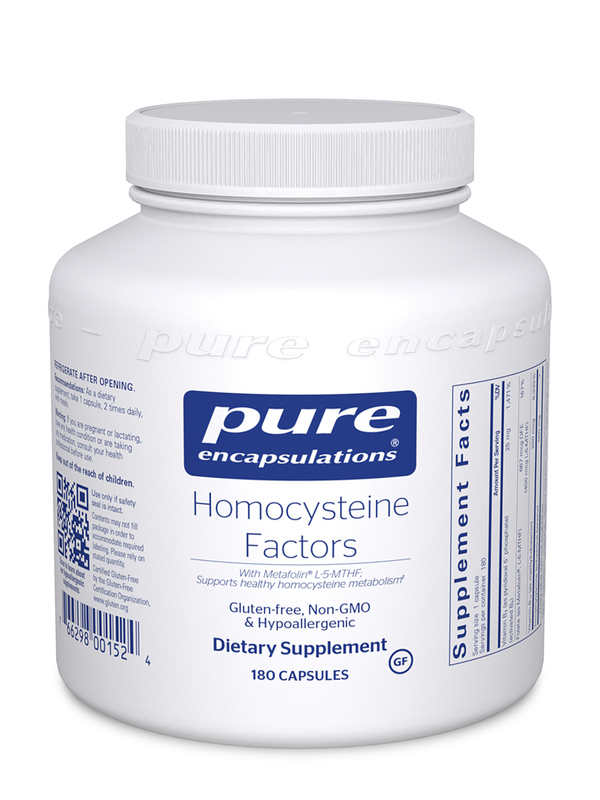 Homocysteine Factors by Pure Encapsulations has it covered. Great combination of ingredients that addresses some of the concerns with my illness. My doctor recommended Homocysteine Factors by Pure Encapsulations to me--even sells them in her office. I usually get them from her but was away so ordered them myself. Not sure if it is because of a heart murmur or my overall condition. 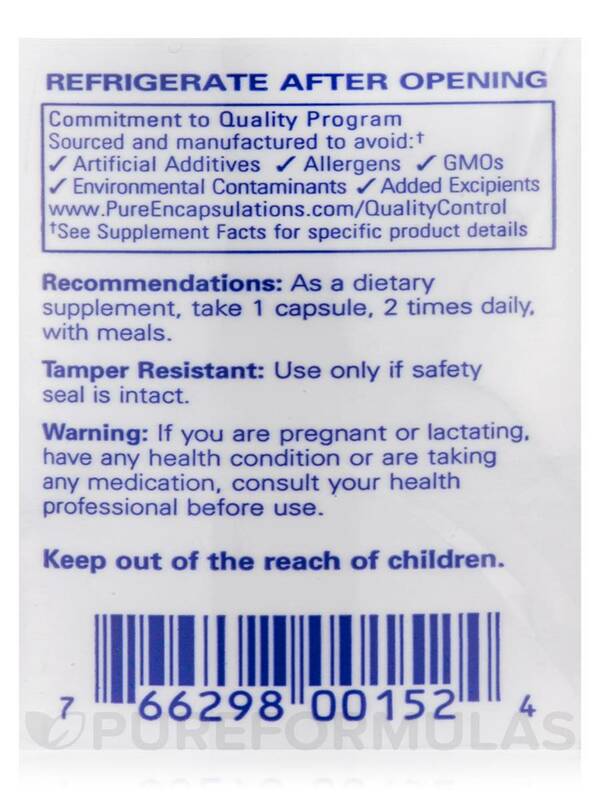 Pure ingredients with no extra ingredients and in a capsule. Homocysteine Factors by Pure Encapsulations was recommended to me by my doctor a month ago. I take Homocysteine Factors twice a day and receive a B12 injection every other week and I feel like a new person!! My energy levels are renewed, my muscles no longer ache & I am sleeping through the night. Energy, mental clearness due to sleeping through the night and decreased muscle ache. That I can't go to the store and pick it up. Homocysteine Factors is an great product. Doctor recommended. Thank you for reaching out to us, Linda. This is a question that your trusted healthcare practitioner would need to answer. They would be able to give you the best response possible since they’d be familiar with your particular health history and needs.